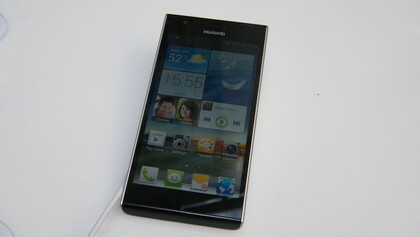 Last year Huawei gave us the world’s slimmest and the world’s most powerful smartphones in the form of the Ascend P1 S and Ascend D Quad, and now the Huawei Ascend P2 has stolen the "world’s fastest smartphone" crown. 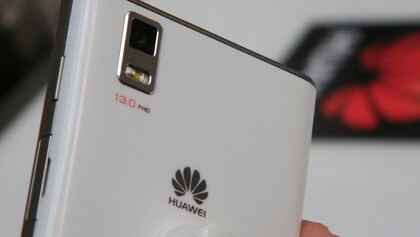 In short, Huawei loves a good record breaker (which means it will absolutely love TechRadar), probably due to the fact it generates additional hype around its smartphone launches. The Chinese firm is firmly setting its sights on the mid- and high-end of the mobile market as it tries to shake off the budget tag it’s developed for itself over recent years. It all started at CES 2013 when the Ascend D2 and huge Ascend Mate took centre stage, and the Ascend P2 now slides in below these two to fill that mid-range void in the line up. 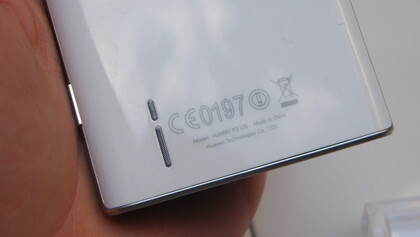 The natural successor to the Ascend P1, the Ascend P2 release date is set for the second quarter of this year and it will cost €399 (around £345/$525/AU$510). For the money you’ll get a 4.7-inch 1280 x 720 display with 315 ppi, 1.5GHz quad-core processor, 1GB of RAM, 16GB of internal storage, 13MP rear camera, 1.3MP front camera, Android Jelly Bean (version 4.1), 4G, NFC and a 2,420mAh battery. 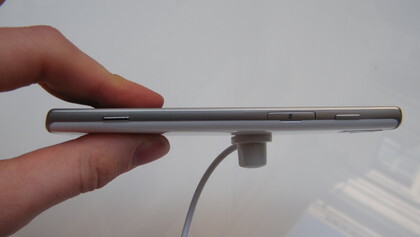 Huawei has managed to cram all that tech into a relatively slender frame with the Ascend P2 measuring 136 x 67 x 8.4mm, and weighing a comfortable 122g. 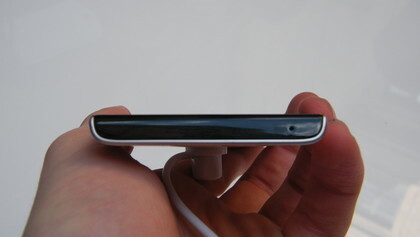 The handset sits nicely in the hand, with the flat back and curved edges of the handset allowing you to grasp it properly, although the all plastic finish does detract a little from the smart, minimalist design. It feels solid enough with the strength enhanced by the sealed chassis, meaning there’s no access to the battery inside the handset. 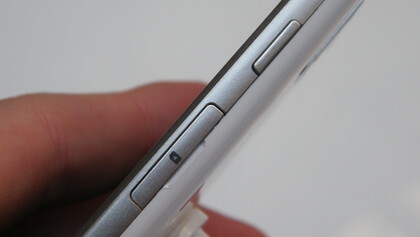 This means you’re left with a microSIM slot on the right hand side of the Ascend P2 which is covered by a simple to remove plastic flap, just below the easy to reach power/lock key. From front on the Gorilla glass which covers the Ascend P2 extends over the top and bottom of the device, which apparently gives a similar effect to an infinity pool – at least that’s according to Huawei’s Head of Device, Richard Yu. However you want to describe the Ascend P2, it’s a tasteful design which is clean and professional and it looks like a handset you might actually want to own. There’s no full HD resolution on the 4.7-inch screen, as Huawei believes there’s no point having anything more than 720p on displays less that 5-inches in size as the human eye can’t distinguish the difference. 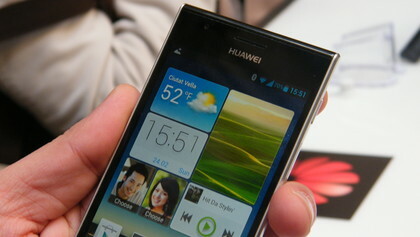 Not everyone is on Huawei’s hymn sheet though as the HTC One, which sports the same size display as the Ascend P2, boasts a full HD screen. The screen on the Ascend P2 is very good though – it’s bright, colourful and well defined making the heavily customised Android Jelly Bean operating system look good. 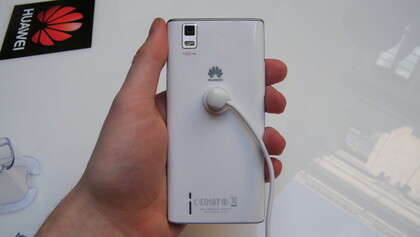 In a similar fashion to Nokia and the Lumia 920, Huawei has equipped the Ascend P2 with what it’s calling Magic Touch allowing you to use the handset whilst wearing gloves – an insanely useful feature we wish more smartphone manufacturers would implement. 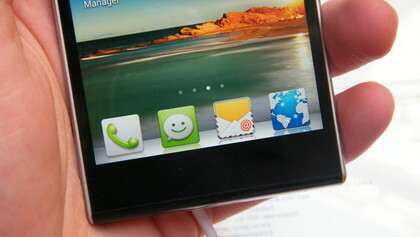 Huawei has gone to town a little with its Emotion UI overlay, as it looks to give the Ascend P2 a different look and feel to the rest of the Android handsets on the market. For example, it has completely removed the app draw from the P2 leaving you with just the homescreens to manage your apps from. At first we found this pretty confusing as we kept wanting to press the app list key at the bottom of the screen, only to find it wasn’t there – however after a short while we became accustomed to the fact we were stuck with just the homescreens. Another unique feature is the ability to group a series of different sized widgets together into one larger widget, to provide a personalised homescreen experience and one that reminds us a little of the variably sized Live Tiles on Windows Phone 8. The default icon design on the Emition UI does come across slightly childish, but the Ascend P2 has over 100 different themes for you to choose from, which changes the icons, wallpaper, widgets and colour scheme. This means you can make the phone look quite a bit smarter without too much effort, but the pared down options may put the Android purists off. You can easily manage your apps by dragging one on top of another to create a folder, and you’ll find a variety of handy quick settings in the notification bar if you drag down from the top of the screen. Moving around Android and jumping in and out of apps is generally pretty good, but the Huawei Ascend P2 lacks the zip of the Samsung Galaxy S3 and HTC One. It’s not a huge issue and it’s certainly not so slow as to infuriate the user, but some applications did take two to three seconds to load up – the camera being one. 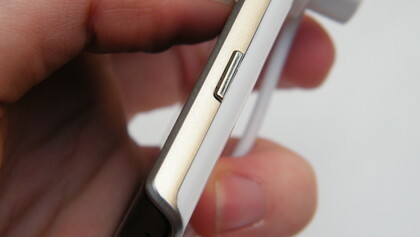 The Ascend P2 sports a dedicated camera key towards the bottom of its right side, which gives you the option to easily load up the app so you can quickly snap a picture. Although the app may take a little time to load, the shutter button is far more responsive and we were able to snap pictures in quick succession without any hint of slow down. Picture quality from the rear facing 13MP camera was very good, helped in part by the presence of auto- and tap-to-focus meaning we could avoid blurry messes most of the time. 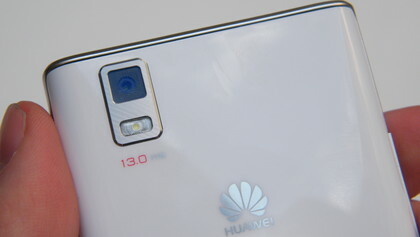 During the launch event for the Ascend P2, Huawei claimed that it had equipped the hanset with a Super Resolution 2x digital zoom which would put an end to poor picture quality. In practice this didn’t quite seem to be the case with some pixelation occurring as we zoomed in, but it wasn’t as much as we’re used to seeing on smartphones. If you like to play around with your photos there are a variety of camera effects and filters available in the app, along with modes such a panorama, HDR and low light. 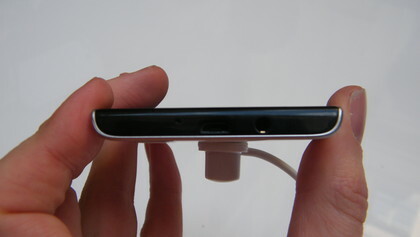 There’s also a front facing 1.3MP camera, which is perfect for video calls or the odd vanity check. Something Huawei is making a big song and dance about – and the reason it’s dubbed the Ascend P2 "the world’s fastest smartphone" – is its internet capabilities. The Ascend P2 is the first smartphone to come equipped with CAT 4 LTE, meaning your able to access even faster 4G speeds – apparently maxing out at 150Mbps. 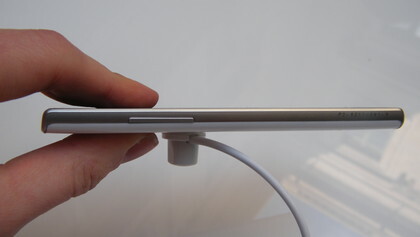 This is faster than the iPhone 5 and Galaxy S3 LTE, which both house the CAT 3 version of the technology. Sadly we weren’t able to put the Ascend P2 properly though its paces as the only internet connection available to us was an rather mediocre 3G network. 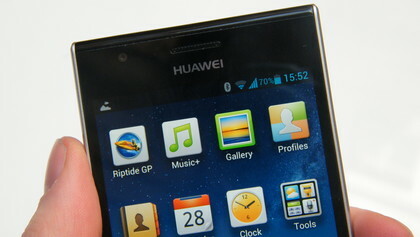 In terms of web browser you’re provided with the perfectly functional Android default, although our surfing experience was distinctly average thanks to that 3G connection – look out for our full Huawei Ascend P2 review for the proper run down of how well the world’s fastest smartphone fares on the web. Web pages do look great though thanks to the 720p display, and the automatic text-reflow made reading out favourite TechRadar articles a breeze. 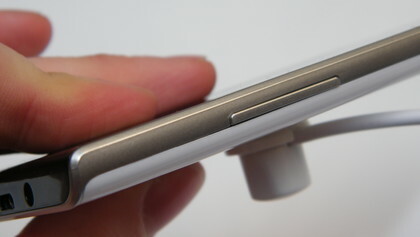 We watched the HD trailer for Rango on the phone and we’re pleased to report that the movie looked fantastic on the Ascend P2 and we would happily watch a full length flick on this device. Thanks to the quad-core processor and 1GB of RAM the Ascend P2 has enough grunt to run even the most taxing of games and Riptide ran smoothly during our play – though we felt the graphics weren’t quite as good as handsets running Tegra 3 processors. 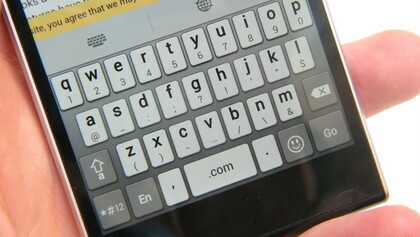 Huawei has also tweaked the onscreen keyboard and thankfully it’s still a pretty decent offering with well spaced buttons and adequate auto correct and next word prediction making tapping out a message pretty easy. 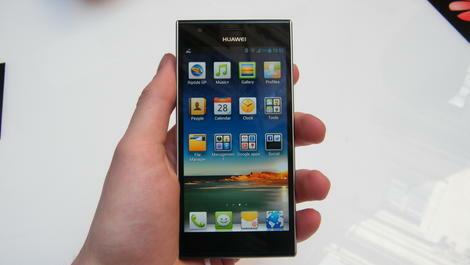 The Huawei Ascend P2 is a solid mid- to high-end smartphone with some decent features and pleasing array of specs. It doesn’t quite have the build quality of the iPhone 5 or HTC One, nor does it have the same snappiness as the excellent Galaxy S3 and the Emotion UI may not be every Android fan’s cup of tea. 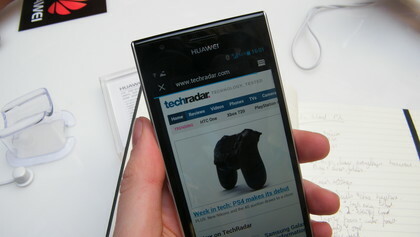 That said it will give the likes of the HTC One S, BlackBerry Z10 and Nokia Lumia 820 a right old run for their money and we look forward to putting the Ascend P2 through its paces in our in-depth review.